Gmail is a webmail service and is maintained and kept secure by the Server holders of the mail service but even then the need of email migration tool for Gmail purpose are demanded by plenty of users. Gmail Backup application was resultantly started being served by our organization for helping users avail a productive solution to make backup of Gmail email data stored in their account. This program owns expertise of working out the conversion of Gmail to PST/MSG, Gmail to MBOX & Gmail to EML to help maintain a backup for the entire Gmail messages. In case, you are not sure as to how to control email migration tool for Gmail data backup process then this is the right solution for you. A freeware trial version of the application is offered which makes it possible for the user to get an illustration beforehand. 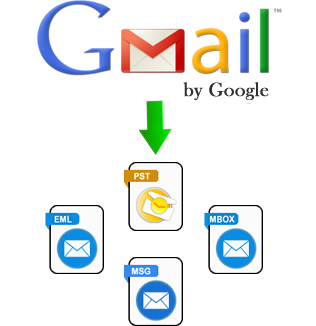 After testing the Gmail to EML/MSG/PST/MBOX transfer process one can get the full licensed edition that helps in executing the entire backup process without restrictions. Gmail is one of the securest web based emailing platform but is also prone to getting disturbed with Server based issues sometimes also leading to data loss. These situations give rise to the need of backing up Gmail data, but to avail such a service there has to be an application only. Gmail data is Server based and cannot be taken into backup which is how email migration tool for Gmail data backup came into existence. Gmail Backup application of our organization is one of the finest solutions available presently for the respective purpose. Taking backup of Gmail data is possible in two forms including PST, MSG, MBOX or EML. There are types of facilities offered for taking desirable type of backup i.e. add time interval, delete after download, backup in the desired file format, backup of emails.